Intended Audience: This article is for those who are considering the purchase of a used concrete pump who have little or no industry experience. Or, for the seasoned industry professional who would just like to reinforce his/her knowledge. Hopefully these 10 steps will help you to determine a go-no-go decision or help you to decide what kind of pump to get. 200 feet of new 3-inch HD pipe mixed with 100 feet of new 3-inch hose, 31 ea HD snap couplings, and a few reducers that will end up costing you about $8 to $10,000 USD. If this package is all 4-inch, plan on $12-15,000 USD. Again, if you can purchase a good used concrete trailer pump with the gear already included, then you will be ahead on the purchase. Along with the trailer concrete pump you will need to budget a tow vehicle. Some trailer concrete pumps are either single or double axel and come in various sizes and are usually determined by cubic yards or meters per hour. As an example, a Ford F350 would make a good tow truck for a 70 cubic yard per hour concrete trailer pump weighing approximately 8,200 lbs. Unless you already own this vehicle, you will need to budget a new or used one here as well. It is important to note that this truck needs to be a flat bed with an air compressor, an 80-gallon water tank, and a few tool boxes. - What is your back up plan if this pump breaks down during a pour? - Most find out that one boom pump is not enough and end up with a few more units because of the previous question. Budget for another boom pump! Only you can answer this question. With a good used concrete trailer line pump costing around $100K USD fully rigged out, you can spend a few thousand dollars or more on a good used concrete boom pump. Concrete trailer pumps are ideal for residential pours and hard to reach areas that a boom pump is not suited for. Other uses for concrete trailer pumps are: shotcrete, masonry grouting, void fills, cellular concrete, and mud jacking. Properly marketed, a concrete trailer pump can represent multiple forms of revenue, whereas a concrete boom pump is designed to deliver a large volume of concrete in minimal time. If you plan to start a concrete pumping service, you should canvas your potential clients and see what they prefer 60% of the time. I say 60% because; one length boom will not cover all the jobs. This is why a concrete pump service has multiple boom lengths. - Contact concrete pumping services in your area and see if they are getting ready to sell a pump out of their inventory. Ask them to price it with all new wear parts and the hydraulic system serviced. This is a good idea if the wear-life on these components is below 50%. 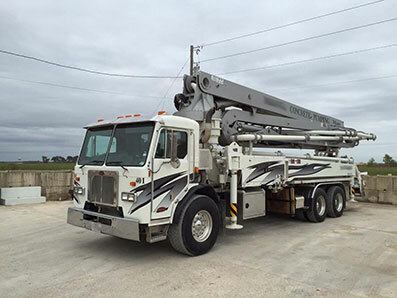 - Brokerage websites offer a vast inventory of good used concrete pumps. Many brokers are knowledgeable of their inventory and some don’t have a clue about the condition or history of the pump you are interested in. Brokers typically do not own the pump they are representing but are merely acting as a sales agent for the seller. This is similar to a realtor selling a home or commercial building. It’s not uncommon for the broker out of Texas to represent a concrete pump out of Seattle, WA. In which he has never seen before, so it’s a good time to dig deeper into the condition and history off the concrete pump. It’s highly recommended that the broker will allow you to converse with the current owner to get more details on the condition and history of the equipment. If the broker will not allow you to talk to the current owner, then you need to move on and take your business elsewhere. - Auctions are another source for shopping and getting familiar with resale value of various makes and models of used concrete pumps. 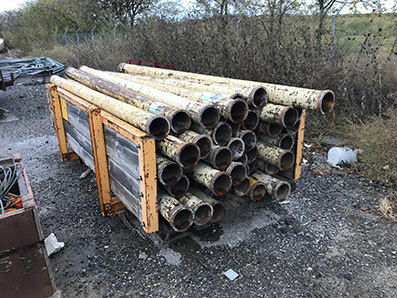 Auction results can sometimes be misleading on the actual value of a used concrete pump as some units sell way below market value and some sell for much more then what they are worth. More than anything it is a great educational experience in the study of human nature as what one perceives as a good deal. Many auction houses will paint a concrete pump, so it shows well to the online bidders. Be careful to make sure you’re not buying paint. Selecting your brand carefully is very important. 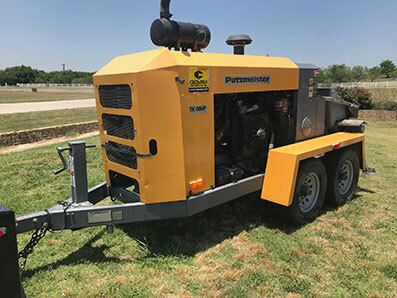 For a trailer concrete line pump we suggest you stay with the following brands for the quality of parts, service and resale value: Putzmeister, Reed, Schwing, Transcrete, and Reinert. This list represents brands with a strong USA presence for the past 20 plus years and brands that have a better than average resale value. For concrete boom pumps we suggest you stay with the following brands for the same before mentioned reasons: Putzmeister, Schwing, Alliance, KCP, Liebherr, and Everdigm. There are several other quality brands that are establishing themselves in the US market, but remember we are here to help the first time buyer who may need to bail out of this purchase if things don’t work out according to plans. Most important! Do not buy a brand that has gone out of business or is no longer supported by the manufacturer! As mentioned before it’s better to be able to talk to the concrete pumps previous owner or owners to get maintenance records and inspection history. This is almost impossible to get from an auction house and sometimes you are not able to get from a broker. Trailer concrete pumps do not require mandated inspections so all you can expect to see is maintenance records. I highly recommend you purchase a good used trailer concrete pump from a previous owner with good recorded maintenance history. On the other hand, a concrete boom pump is required by the industry to have an annual boom inspection and DOT inspection on the tractor (truck) each and every year. Some owners comply with this industry standard and some do not. It is easier to buy from someone who does. Boom inspections will show you the history of repairs and this is usually a good indicator of how the rest of the rig was maintained. With regards to boom pumps, we recommend you contact the manufacturer with the concrete pumps serial number and boom serial number and see if the two are still a match. If the boom serial does not match the number of the MFG, then you may have an older boom that replaced the original boom and there is a story behind all this. If this was not disclosed to you up front, you probably need to walk away from this pump. With all the shopping, phone calls, emails back and forth, internet searches, possible travel expenses, you are in fact looking to purchase a machine that may have several other suitors. This may be a good time to negotiate a deposit to hold. A deposit to hold should include a 100% refund clause, pending a pre-buy inspection. 10 days is usually the time frame you should ask for to tie-up this unit in order to make travel plans, research pump’s history and condition. This needs to be on a one page legal document provided to the seller by you. We suggest you spend a few dollars with your attorney or try one of the many legal websites. Do not just send someone you don’t know a large deposit without this agreement that spells out the terms and conditions of the refund. Never send a deposit outside the country! We suggest that once you receive the signed document back that you wire the funds to the seller and per the agreement this is how you get your refund returned if you choose not to purchase their pump. Another option is ty to locate an escrow agent that will handle this for you. Some major credit card companies may provide this service. We suggest the amount you send is either 10% of the asking price or a $5,000 maximum. Never send more than this amount, it’s just not necessary as all the deposit is for, is to show serious intent of purchase. Once the deposit has been made you can now plan your pre-buy inspection without worrying about the unit being bought out from under you while you are at 36,000 feet in a plane in route to the destination. After you located the concrete pump you want to buy its time to establish a fair price. After researching the market for comparable options, researching the pump’s history, and getting a pre-buy inspection, here are some deductions you should use to get a better deal. - Dollar amount you are paying less your deposit which is now converted to a down payment. - Sales tax is a state by state issue. In most cases you pay this in the state you plan to register the equipment. If title is free and clear, make sure you pick it up when you pay for the pump or have it sent fed-ex to you. Never allow the seller to send a title regular snail mail. Pay for this extra expense if needed as it’s worth the peace of mind.